"We've learned a lot about Europa in the past few years," says William B. McKinnon, professor of earth and planetary sciences at Washington University in St. Louis. McKinnon discussed some of these recent findings and new opportunities for exploring Europa in a news briefing at the meeting of the American Geophysical Union in San Francisco. He was joined by colleagues Donald Blankenship, research scientist at the Institute for Geophysics at the University of Texas at Austin's Jackson School of Geosciences, and Peter Doran, associate professor of earth and environmental sciences at the University of Illinois at Chicago. McKinnon points to refined methods that can use combined measurements of gravity and the magnetic field made from orbit to characterize Europa's ocean. By observing how the moon flexes and deforms and by measuring magnetic variations, researchers can determine how thick or thin the ice is over the ocean and even learn how salty the ocean is. A new model shows that radiation on Europa is much less � up to two-thirds less � than previous models predicted, making the environment much more hospitable for orbiting spacecraft or landers to operate. Sophisticated reprocessing of data from NASA's Galileo mission has revealed new information about the chemistry of Europa's surface. It maps the presence of carbon dioxide, an important chemical for life, most probably coming from the ocean beneath the surface. This indicates that improved measurements from orbit have the chance to detect compounds not found in the Galileo data. Future explorations of Europa will benefit from lessons learned from NASA's Cassini spacecraft's recent findings of active geysers on Saturn's moon Enceladus. "Europa is a young, geologically active body like Enceladus," says McKinnon. Galileo didn't see any plumes on Europa like those spouting from Enceladus, but it didn't have the best instrumentation to detect the telltale hot spots. "Now we know what we should look for," says McKinnon, "and we should expect the unexpected." New radar sounding techniques will be a key component for exploring Europa. "There have been theories about whether the ice above the ocean is thick or thin, and now we have the ability to determine this with radar," says Blankenship. "That's been proved by the radar on Mars Express, which imaged the north polar cap of Mars, and the higher-resolution radar on the Mars Reconnaissance Orbiter. 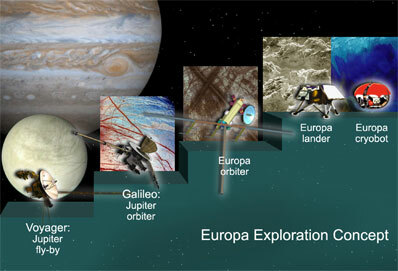 Radar can give us a detailed cross section through the ice shell on Europa." The ice-penetrating radar will also be able to locate liquid water both within and beneath the shell, just as it can spot water within crevasses and lakes beneath the ice of Antarctica. "Free water within the icy shell and its relationship to the underlying ocean will be a critical factor in determining the habitability of Europa," he continues. Researchers are also preparing for the day in the future when they will be able to get to Europa's surface and ultimately into its ocean to explore it directly. "In the meantime, we're using extreme environments on Earth as our laboratory," says Doran. "Ice-covered lakes in Antarctica are good, small-scale analogs to what we might find on Europa." Doran is lead investigator of a project called Endurance, which, in collaboration with Stone Aerospace, is developing an autonomous underwater robotic vehicle to test approaches and procedures for exploring Europa's ocean. The project is funded by NASA's Astrobiology Science and Technology for Exploring Planets program. "We're testing the vehicle in Wisconsin in February, 2008," Doran says, "and then we'll be deploying it in Antarctica later in the year." The robotic explorer will be able to create three-dimensional maps of the subsurface Antarctic lake. It will also be able to map the biochemistry of the water body, pinpointing the chemical signatures that may indicate life.